If anyone would feel that there is any amount of nostalgia in making this pick, you would be absolutely correct. Jimmy Rollins was the central figure on the Phillies roster for more than a decade. He is a legitimate franchise icon. But there is more to this selection than simple nostalgia. In the 2014 season, Jimmy had a strong bounce-back year. He cracked 15 homers, drove in 55 runs, scored 78 times, and stole 28 bases. His OPS+ of 101 was in line with the very best seasons in the prime years of his career, outside of his 2007 MVP season. Defensively, Jimmy may not be at his peak, when he won 4 Gold Gloves, including one as recently as 2012. But he was outstanding yet again at one of the toughest positions on the diamond. The 35-year old registered a .988 Fielding Percentage, tied for 2nd best in his career, and his UZR was 2nd in all of baseball. He also had a career-defining moment this past season. OnSaturday afternoon, June 14th at Citizens Bank Park, the Phils were leading the Chicago Cubs by 4-3. Rollins led off the bottom of the 5th inning against Cubs righty Edwin Jackson with a clean line-drive base hit to rightfield. The hit was the 2,235th of his career, which broke Mike Schmidt’s franchise career record that stood for a quarter-century. Schmidt had broken the old record of 2,217 which Rich Ashburn had set decades earlier. Ashburn broke the record of 2.213 set by Ed Delahanty, a record that also stood for decades. All three of Schmidt, Ashburn, and Delahanty are now enshrined in the Baseball Hall of Fame. There will one day be a strong case for Jimmy Rollins to be enshrined there in Cooperstown, New York as well. But before that time comes, Jimmy will likely finish out his career in another uniform. Rollins completed his big year with a trade. As the first major move in breaking up the ‘Glory Era’ core of players, he was dealt to the Los Angeles Dodgers. In return the Phillies acquired pitching prospects Tom Windle and Zach Eflin. While it’s too soon to know how they will pan out, they immediately become Top 5 organizational prospects. So even in leaving after 15 seasons, Jimmy Rollins contributed to the Phillies future, possibly in a substantive way. 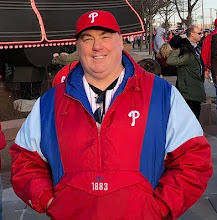 As he left, he gave an exclusive interview to CSN Phillies insider Jim Salisbury. Jimmy Rollins may have peaked with his 2007 NL Most Valuable Player award and the 2008 World Series victory. But for the better part of 15 seasons he was the driving force in the Phillies lineup. He was the one who pushed. He was the one who fostered the clubhouse camaraderie. For both his excellent 2014 season in the twilight of his career, in what appears to be his Phillies finale, and for all that he has meant to this team for a decade and a half, Jimmy Rollins is the 2014 Philadelphia Phillies Person of the Year.